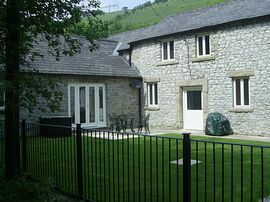 Riverside House is a large luxury holiday cottage, situated in an unspoiled conservation area in Litton Mill, near Buxton in the Peak District National Park. Traditional features include exposed beams, huge vaulted ceiling in lounge, log burning stove, and Italian stone tiles and wood flooring downstairs. Pet and child friendly, with safe enclosed garden and patio/BBQ area. 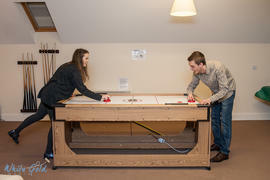 A separate games room includes pool, snooker, table football and table tennis. The holiday cottage is an ideal base for sightseeing as it is near Chatsworth House, Bakewell, Buxton and Alton Towers is only 38 miles away. Great location for walking, from the doorstep there are walks to suit all abilities, bird watching, caving, climbing, cycling, or simply getting away from it all at any time of year. The cottage has secure parking on a private gated drive and in a large detached garage. With parking for 4 cars. Sleeping 9+3 (additional sofa bed in lounge, z-bed, cot and single chair bed for small child only) with one of the bedrooms and bathrooms downstairs. Modern ensuite to master bedroom with spacious shower, and family bathroom with shower and separate bath. There is an additional downstairs cloakroom with shower. 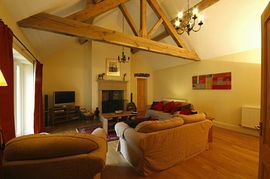 Huge feature lounge with king post truss beams and welcoming log burning stove as well as surround sound TV/CD/DVD and Sky Sports and Films. The large dining room and kitchen make this property suitable for families and groups to eat and relax together. There is an additional seating area in the large entrance hall including ample space for coats and boots. 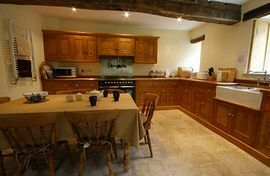 The kitchen is craftsman built with a large range cooker, two fridges, freezer, dishwasher and microwave. A separate utility room with washing machine and dryer. 3 Double Bedrooms (one has link attached king-size bed, which can be 2 singles), 1 Triple Bedroom. 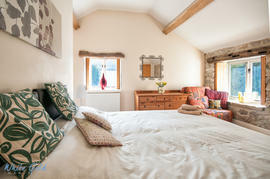 One of the double rooms is downstairs with a very comfortable extra large double sofa bed in the lounge. This downstairs bedroom also has a separate TV and Video. One of the upstairs bedrooms has 3 single beds. Cot supplied. Bathrooms: 3 Bathrooms. The family bathroom has a separate bath and large separate shower. The ensuite bathroom has a large shower cubicle. The downstairs bathroom has a large shower cubicle. General: Real Fire, Central Heating, Telephone, House Linen, Towels Provided. An unlimited supply of logs for the wood burning stove are provided. All beds are made up ready for occupation with towels for your stay. The telephone can be used for local and emergency calls. Stunning riverside location in quiet conservation village. Spectacular walks from the doorstep for all abilities. Downstairs bedroom and bathroom. Level entrance from rear of house and only one step in whole of downstairs areas. Ramp provided. Well behaved dogs in downstairs area. BBQ, patio seating, games room above garage,table tennis in garage. Local Services: Pubs within walking distance or very easy drive. Local shops, pubs, cafe and fish and chips at nearby village of Tideswell. Turn off at Junction 29 and drive toward Chesterfield on the A617. Follow the single-track road along by the River Wye, under Ravens Tor to Litton Mill. Riverside House is the FIRST house on the right hand side. Turn in the area opposite the telephone box and park immediately alongside the house while gaining entry before parking in the private courtyard behind the double gates immediately next to the house. Low Season: £897.00 per week, 2-4 days £741.00. Prices vary throughout the year please call or email for futher information.